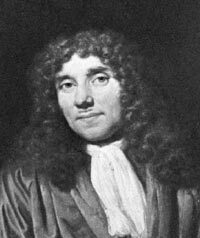 Antony van Leeuwenhoek is considered to be one of the founding fathers of microbiology, however he was not a likely scientist. A draper and cloth merchant by trade he lived in Delft, Holland. Unlike most of the scholars of his time Leeuwenhoek came from a family of tradesmen, he never amassed any great wealth, received no higher education or university degrees, and knew no languages other than his native Dutch. With skill, perseverance, passion, a limitless curiosity and an open mind, Leeuwenhoek succeeded in making some of the most important discoveries in establishing the study of microbiology. Leeuwenhoek was the first to observe and carefully document bacteria, free-living and parasitic microscopic protists, sperm cells, blood cells, microscopic nematodes and rotifers, along with many other of his discoveries. His research, which was widely circulated, opened up an entire world of microscopic life to the awareness of scholars who were pioneers in the emerging science of microbiology. Early in his career while running his draper’s shop, Van Leeuwenhoek wanted to see the quality of the thread better than current magnifying lenses available allowed. He suspected he was being cheated in the quality and material of thread he was purchasing. He began to develop an interest in lens-making to precisely identify the type and quality of thread he was purchasing by employing microscopes of his own design. Van Leeuwenhoek’s interest in microscopes and a familiarity with glass processing led to one of the most significant technical insights in biological science. By placing the middle of a small rod of soda lime glass in a hot flame, Van Leeuwenhoek could pull the hot section apart to create two long threads of glass. Then, by reinserting the end of one thread into the flame, he could create a very small, high-quality glass sphere. These spheres became the lenses of his microscopes. The smaller the diameter of the sphere, the more magnification power was produced. It was Van Leeuwenhoek’s desire to see thread for his drapery shop that fueled his desire to develop more powerful microscopes. By pulling glass into thread and melting them into spheres he was able to make the required lenses. At Thread Bioscience the spirit of Van Leeuwenhoek’s passion for discovery and desire to develop technology to solve challenges lives on. Our patented technology is taking a different approach to biological testing. By integrating biotechnology with microbiological science Thread’s bacteriuria test, CultureStat®, provides accurate results at the Point Of Care, in less time, promotes antibiotic stewardship and reduces healthcare cost.